when i run speedtest from my computer i get about 20-25 Mbps downhill, and around 65-70 mbps up. When i take my tablet/"laptop" and connect it by wire directly into the fiber converter, i get near 100/100 (this "laptop" only do 100 Mbps), so internet works as it should. I have switched cables with between the fibre converter in the box it sits in at the door. and the one pfsense are connected to the wall (that goes to the box at the door), still same slow speeds. I have disabled hardware offload and rebooted. I dont use squid and only packages installed are Apcupsd and mailreport. I dont use traffic shaping either. 16 GB of ram installed and only 2% used. I used to have  the ability to max my connection, but now pfSense barely give 10%. > Vendor: American Megatrends Inc.
> Manufacturer: Gigabyte Technology Co., Ltd.
> Version: To be filled by O.E.M. > Serial Number: To be filled by O.E.M. > SKU Number: To be filled by O.E.M. > Family: To be filled by O.E.M. > Asset Tag: To be filled by O.E.M. > Location In Chassis: To be filled by O.E.M. Nobody doesnt even got any idea what could be wrong and what i could do to check/fix? Mainboard details aren't all that important. What type of NIC is em0 & em1? Could traffic shaping or limiter be turned on in pfSense accidentally? I would check that first. Those kinds of things are very hard to turn on accidentally, considering how much configuration they require. I would look hard at the ethernet between the fiber converter and pfSense's WAN NIC. Make sure everything is good and they're both negotiating gig. What is the make/model of the fiber converter? I would look for errors on the WAN NIC. I might try a managed switch with a GBIC and a blank VLAN between pfSense and the fiber so you can get error counters and statistics on both sides. You'd be replacing the fiber converter with a blank vlan with one untagged copper and one untagged fiber port. You probably want to disable spanning tree on the VLAN and/or ports. I would call the ISP and see what they see as far as errors on their port. An i5 ought to easily do 250/100. This would be my recommended approach if the "fiber converter" is just a fiber <-> copper media converter. If, however, the "fiber converter" is actually an ONT on a PON network, this won't work, as you can only use an ONT authorised by the network operator (which almost always means one they supplied). My recommended approach in this scenario is similar - connect the "fiber converter" and the pfSense interface via a switch, for example using a dedicated VLAN. I use this approach successfully with a VDSL2 bridge. Disabling spanning tree on such a VLAN is a good idea, especially in the media converter scenario. The ISP's network will probably filter it or otherwise ignore it, but the possibility remains that they might not take too kindly to spanning tree traffic coming from your end of the connection. results by making perhaps related to the same hardware also same results. with ease. So it could be pending on more or less things we should all thing about and proof. and the WAN port of the pfSense. Could this be? In pfSense you will see perhaps "1000 MBit/s full Duplex auto." But in real life there will be perhaps only a 10 MBit/s or 100 MBit/s connection. that will be changing then more or less often. What NIC or NICs you are using? Are all unused things will be disabled in the BIOS? right counting? Only a thought! I havent changed anything, so it must been a hickups at the ISP area for almost a week. Anyways, seems its been resolved by its own. I have 250/100 Mbps fiber connection. and shorten it a bit for passing the NAT part and firewall rules. So all is fine on your side as I see it right. Unfortunately, the good speeds only held for a few days, i am still down to 10% of my possible max. I have concluded with testing that it is somewhere at my pfSense box, but i cannot find out what could possible be the problem. Reboots doesnt help. I saw an earlier post, i dont have a modem (like cable, isdn). This system is less then a year old afaik, but i wounder if perhaps the usb key could be the culprit and a reinstall on a new one would help..
a broken usb key will get you filesystem errors & perhaps boot issues. It's unlikely to cause a slow wan link. 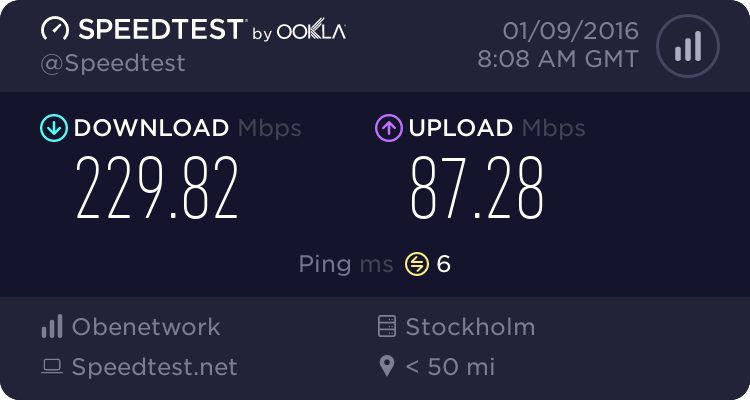 do you get fast speeds when you connect a different system (laptop/desktop) directly on the converter ? what speeds do you get from pfsense console ? When i use my Asus Transformetbook T200T, i can make the network cards 100/100, directly connected to the converter. When i tried the download thru pfSense cli, using a close to me service to download both a 100Mb and a 1Gb file to "/dev/null"(? ), im getting the same speed, roughly around 25 Mbps download, i have changed to new/old/other cables both on the converter side, and between the wall and pfSense box. I am going to stop by a store today and pick up a few more new patch cables to change to completely new cables on both side. I cannot do anything about the wall installed cable. And buying a new 2-4 port PCIx card costs almost the same as buying a pfSense hardware in the store, and im not sure if its the nic or not. The WAN card is an Intel PCIx, lan uses the onboard, but im testing the speed with fetch directly at the pfSense ssh console.